Designers have complete freedom of choice of any commercially available veneer, laminate or PVC finish. Bespoke designs can be incorporated into any finish. Steel frames are available to reduce installation and maintenance costs, allowing business to carry on uninterrupted. To maintain aesthetics reception desks, panel work and IPS systems can be manufactured from the same finishes. Bespoke items of furniture can be created for more difficult areas. 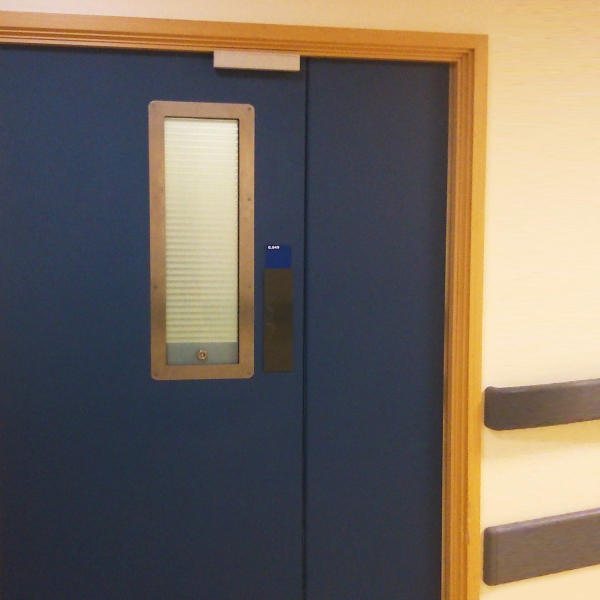 The brief was to create hard wearing, low maintenance door sets that would stand up to the riggors of daily life in a heavy footfall area. Telescopic steel teel frames were supplied for these installations. This would allow a fully finished frame to be installed in a matter of minutes, with no requirements for site decorators to come in. They would also not require regular decorating as part of the maintenance package. The door leaves supplied were all severe duty cores, the highest rating available for wooden core doors. This installation required door sets that would not be damaged by the daily flow of guests moving around the hotel with their suitcases. Lewis Aldridge selected a high pressure laminate and wrapped the foors and frames in it. This produced a high scratch resistant finish which could easliy be kept clean and would look new for years to come.